Im Verlauf des heutigen Abends haben die Entwickler von Heroes of the Storm einen neuen Content Patch auf die Liveserver der nordamerikanischen Spielregion dieses Titels aufgespielt, der aufgrund der später angesetzten Wartungsarbeiten leider erst zwischen 03.00 und 05:00 Uhr morgens in Europa erscheinen wird. Gleichzeitig damit veröffentlichten die für diesen Team Brawler zuständigen Mitarbeiter von Blizzard Entertainment freundlicherweise auch wieder offizielle englische Patchnotes zu diesem Update auf ihrer Communityseite, die ganz genau auflisten, was für komplette Neuerungen und Veränderungen an bestehenden Inhalten dieser Patch mit sich brachte. 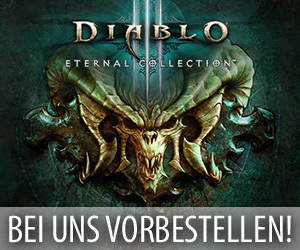 Dieser von den Entwicklern zusammengestellten Übersicht zufolge beinhaltet dieser neue Patch unter anderem eine Reihe von Fehlerbehebungen, die notwendigen Inhalte für die Schlotternächte 2017, den neuen Helden „Junkrat“ und umfangreiche Anpassungen an Muradin und Zul’jin. Wer nun gerne noch mehr über die Inhalte dieses Updates erfahren möchte, der sollte einen Blick auf die folgenden Patchnotes werfen. Our latest update for the Heroes of the Storm brings a new Hero, balance changes, and more to the Nexus! Note: * Orange Text and an Asterisk indicate a change or addition between PTR and live patch notes. Play 25 games during Hallow’s End in any mode except Custom Games, Training, or Heroes Brawl to earn spooky new items! Once Hallow’s End begins after October 17, all Loot Chests you earn through progression (except Hero-Specific Chests), or purchase using Gems will be replaced with Hallow’s End Loot Chests. Weekly Brawl Rewards after October 20 will also award one Hallow’s End Chest. Also starting with Hallow’s End, special event Loot Chests will now guarantee at least one of the limited-time items from that event—including portraits, sprays, skins, and mounts! Until Hallow’s End concludes during the week of November 13, you’ll pick up one of these limited-time Loot Chests every time you level-up or earn a weekly Heroes Brawl reward. You can also head to the Loot tab in-game to purchase Rare Hallow’s End Chests directly using Gems. Additionally, please note that any Loot Chests you already own prior to the start of the event will not convert to Hallow’s End Chests. The hotkeys to switch between the Stats, Talents, and Death Recap tabs of the leader panel (currently F1, F2, and F3) can now be rebound in the Hotkeys menu. These hotkeys now provide quick access to the respective tab of the leader panel when the hotkey is held down. In July, we announced our intention to end support for Windows XP and Windows Vista in Heroes of the Storm. With this patch, Heroes of the Storm will no longer run on these two operating systems. Players who are affected by this change are encouraged to upgrade to a newer OS version. Launch a grenade that explodes at the end of its path or upon hitting an enemy, dealing 117 damage to nearby enemies. Grenades can ricochet off of terrain. Deals 50% less damage to Structures. Stores up to 4 charges. Frag Launcher’s cooldown replenishes all charges at the same time. Place a mine on the ground. 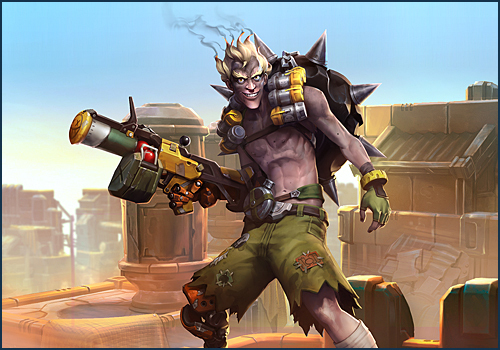 Junkrat’s Trait can be activated to detonate the mine, dealing 180 damage to nearby enemies and knocking them back. Junkrat can also be affected by Concussion Mine, but takes no damage. Limit 1 active mine. Create a motorized bomb with 500 Health that lasts 15 seconds. While active, Junkrat is immobile but gains control of RIP-Tire’s movement. RIP-Tire can be reactivated to detonate immediately, knocking nearby enemies back, and dealing 750 damage to enemies in the center of the blast, and 450 damage to enemies outside of the center. Developer Comment:There are very few moments in the Nexus more intoxicating than beheading four enemy Heroes at once with Guillotine. Unfortunately, it was always a difficult choice to make when the time to pick Heroics came about. Taz’Dingo’s synergy with his heavy attack-damage nature was very difficult to pass up. While we did not want to mess with a winning combination, we did want to augment his standard build and give the old troll some shiny new tools in which to help quickly dispatch his foes. His baseline quest is focused directly at what he does best and should help him feel progressively more potent as the match unravels. As with all of our reworks, we are extremely excited to hear what you think and greatly appreciate any feedback you have! !Quest: Hit 25 enemy Heroes with Storm Bolt. Enemy Heroes who die within 2.5 seconds of being hit by Storm Bolt grant 3 stacks. Second Thunder Clap now also applies a 25% Attack Speed slow for 2.5 seconds. Developer Comment: One of our goals with our changes to Muradin, and with many of our changes to Warriors going forward is to better normalize the amount of damage that they are able to put out. While we think it can be fun to play a Warrior who also does a ton of damage, we also want to make sure that Assassins have the primary role of doing high amounts of burst or sustained damage to the enemy team. In Muradin’s case, we’re hoping to focus him more towards being a highly durable Warrior who has a high amount of crowd control to both peel for allies and enable kills for his team. We liked the gameplay that Perfect Storm gave Muradin in rewarding him for hitting enemy Heroes with Storm Bolt, and his new baseline quest should also hopefully reward him for intelligently using Storm Bolt to secure kills due to the bonus stacks that he will gain. Muradin’s talent tree had a lot of talents that were not being utilized well, both from a pick and win rate perspective, so we’ve consolidated a lot of the power of those talents in order to make his them more competitive with one another. Note: Seasonal Items from previous Hallow’s End events have also been temporarily re-added to the game. You can find more information in our Hallow’s End blog. D.Va: The keychain attached to D.Va’s Light Gun will now correctly appear during Hero Select. Leoric: Fixed an issue preventing Leoric’s Basic Attack cleave animation from playing when using certain skins. Tyrande: The area of effect indicator for Eagle Eye Tyrande’s Lunar Flare should now be more visually apparent when cast on Sky Temple while using Low graphic settings. Zeratul: Zeratul’s face mask will no longer appear to stretch in the Collection while using Low graphic settings. Garrosh: Casting Body Check with the Brute Force Talent on a Boss will no longer cause a Healing debuff icon to appear next to its Health bar. Garrosh: Fixed an issue causing Body Check to receive less bonus damage than intended after casting Double Up to reach 50 Armor. Jaina: Fixed an issue that prevented Summon Water Elemental from being cast on the opposite side of unpathable terrain in areas that are within range and visible to the player. Johanna: Fixed an issue causing the Shield Glare to lower the cooldown of the Blinded by the Light talent by an incorrect amount. Kel’Thuzad: Shadow Fissure can now be cast on the minimap. Kel’Thuzad: Shadow Fissure can now be cast between map levels on the Haunted Mines battleground. Lunara: Fixed an issue preventing Lunara from Leaping over several different friendly units after choosing the Boundless Stride talent. Rehgar: Fixed an issue that drastically reduced the attack range of Feral Lunge. Right clicking a player in your friends list and choosing the Whisper option will once again open the chat input field. Score Screen: The counter for Lt. Morales’ Clear! Talent will no longer disappear from the in-game score screen while she is inside a Medivac. Denn es gibt nur zwei Sachen auf dieser Welt die alle Probleme lösen. Bares und Explosionen!